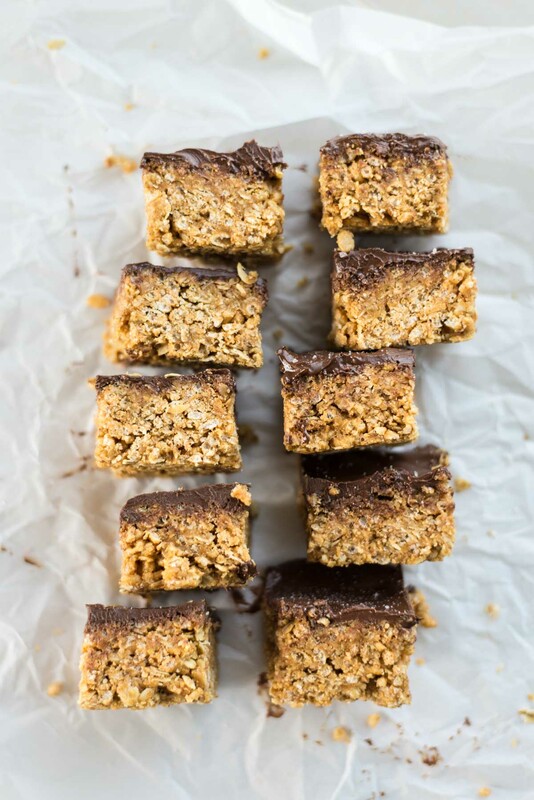 Here’s take number seven of trying to create the perfect healthy scotcheroo recipe from the traditional rendition of the completely unhealthy scotcheroo. Don’t worry, the hubs has no complaints. While the recipe has slowly progressed for the better, the first was still very edible. I keep wondering when he is going to get sick of eating them, but apparently that can’t happen. 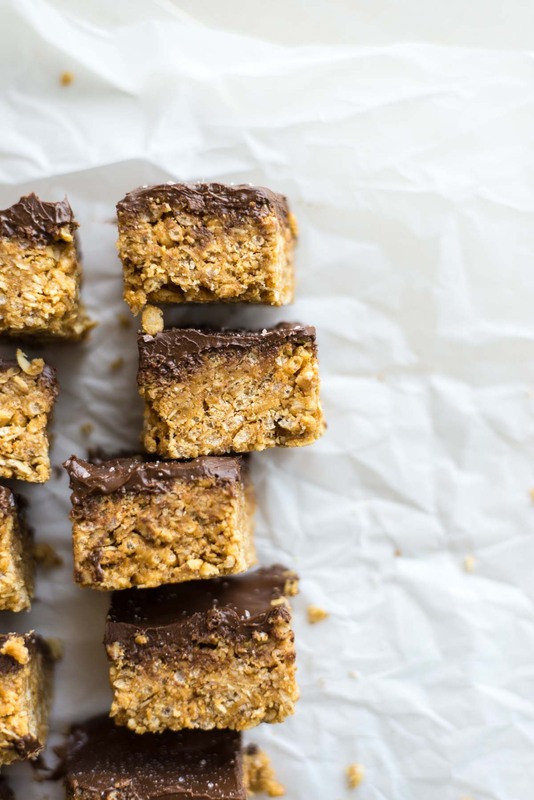 Fortunately for the sake my sanity, regardless of his appetite, I’ve nailed the best healthy scotcheroo recipe you’ll ever have. What I thought would be an impossible feat after actually looking at the traditional scotcheroo recipe has been made possible. Surprisingly you can cut more than half the sugar from this recipe and have it still taste as delightful as before. Well so the critiques tell me. I have to admit, this is my least favorite dessert. I’d rather just have a marshmallow rice krispy buuuuut we’ll chalk this up to being a good wife and listening to the recommendations of my family. I need a lot of brownie points can you tell? So the trick and the only way to get these to stick is the addition of…. Flax meal and oatmeal, the two binding agents. Yes, we threw in an entire cup of flax meal adding an extra boost, or the only boost of nutritional health to this recipe. I can promise, you won’t notice the flax meal. 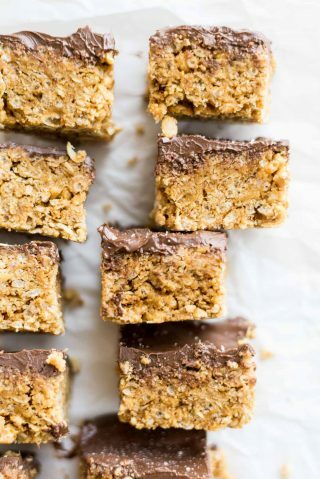 The oatmeal on the other hand adds a slightly different texture than the traditional crisp but it just becomes slightly more like a no-bake cookie. I can almost guarantee that 99% of those people who like scotcheroos also like no-bake cookies so I’d still count this as a win. 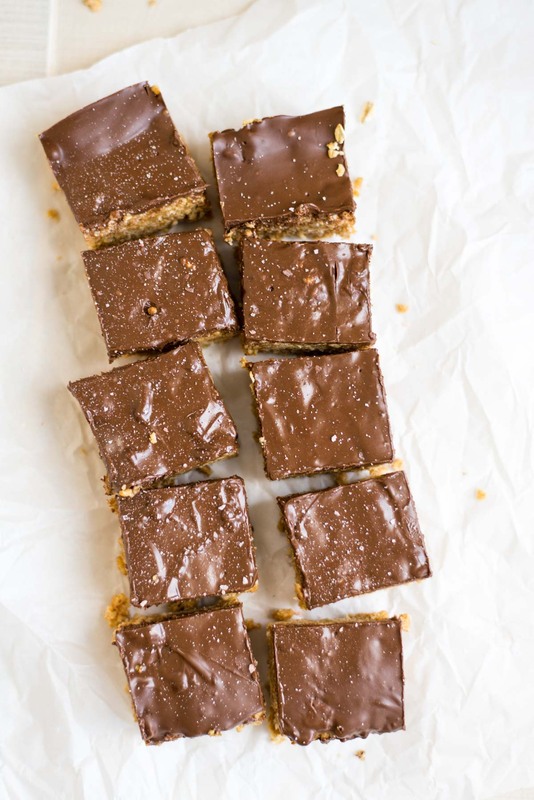 Regardless, I’d file this recipe away for those times when life calls for scotcheroos and an occasional ‘special’ treat in the lunch box (big kids or little kids). In a large bowl mix together crispy rice cereal, old fashioned oats and flax meal. Set aside. Once it just begins to boil, add peanut butter and 2 Tbsp coconut oil, stir to combine and turn off heat. Stir in vanilla and pour over crispy rice mixture. Mix until it is all combined and pour into a 7x11 inch pan and press to flatten. 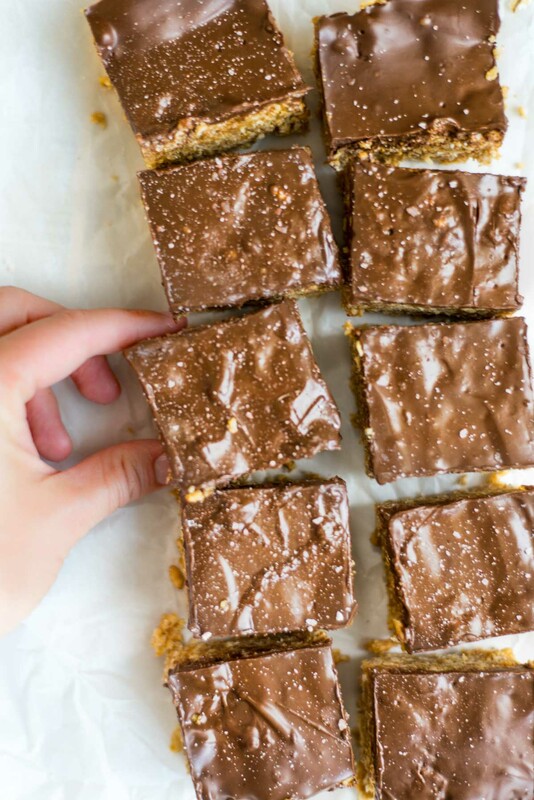 Melt chocolate and 1 Tbsp coconut oil in a double broiler. Pour over crispy rice and peanut butter mixture and spread until the top is coated. Sprinkle with course sea salt (optional) and let cool to harden.